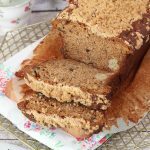 The Final episode of The Great British Bake Off 2017 aired this week and we saw the last 3 bakers; Kate, Sophie and Steven challenged to a variety of bakes including knotted bread & bread rolls for the Signature round. 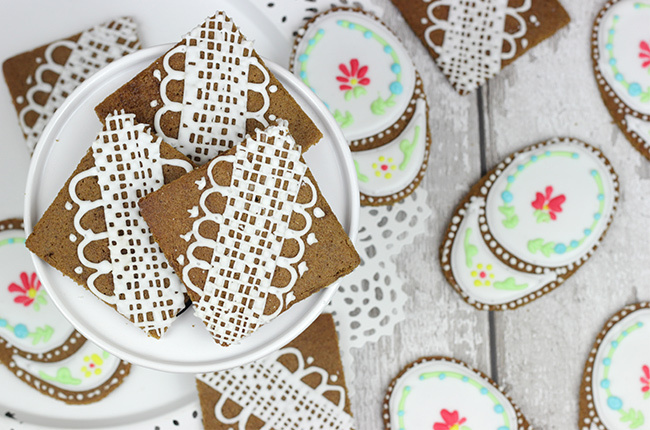 For the Technical Challenge, Prue set them the task of creating iced ginger biscuits that had to be baked to the point that they created a “snap” sound when broken in half and decorated with intricate iced patterns! Finally, for the Show Stopper they had to create perfectly layered Entremet cakes finished with a shiny mirror glaze. Kate went for white chocolate and yuzu in hers, Steven created a Ying Yang design with one white and one with a galaxy mirror glaze to represent the beautiful night sky and Northern Lights and Sophie’s idea was beautiful with her creation entitled ‘Ode to the Honey Bee’ with the flavours of honey as well as the honey bee theme continuing into the decoration! Sophie was pretty consistent and calm when creating her bakes throughout the series and she was one of my favourites and I’m so glad she won this year! For my Final GBBO bake along creation, I decided to bake Prue’s iced ginger biscuits as I not only love a nice sweet, spicy biscuit but also wanted to try out the variety of piped icing. 1) Lightly grease 2 baking sheets with greaseproof paper. Beat the butter, sugar and molasses in a bowl of a free-standing mixer fitted with a paddle attachment or large bowl using an electric hand whisk until fluffy. Gradually add the egg, beating well between each addition. 2) Sift together all the remaining ingredients in a bowl then stir into the butter mixture. 3) Press the dough into a flat layer between 2 sheets of greaseproof paper. Chill for 1 hour until firm. 4) Heat the oven to 190°C/fan 170°C/gas mark 5. 5) On a lightly floured surface, roll out the dough to 5mm thick. 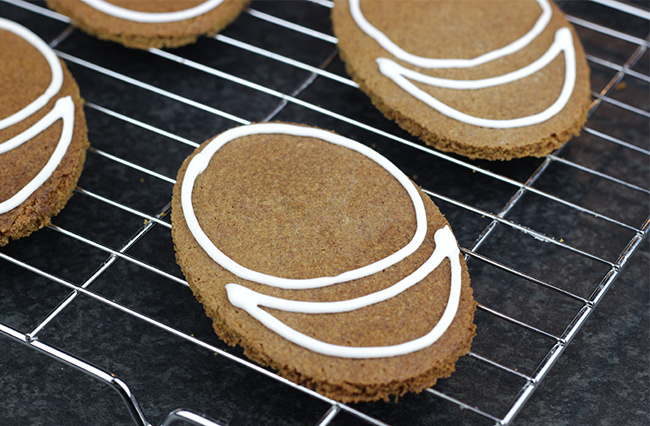 Cut out 6, 8cm square biscuits and 6, 10cm long oval biscuits and place on the baking sheets. Chill until firm. 6) Bake in the middle of the oven for 8-12 minutes or until the edge of the biscuits are lightly browned. Cool for 1 minute, then transfer to a wire rack to cool completely. 7) For the royal icing, mix the egg white with 3 tbsp of the icing sugar in a large bowl and add the lemon juice. 8) Add the remaining icing sugar gradually and mix very well. 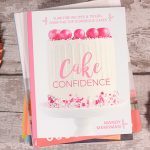 It will form a large ball then you’ll need to gradually add cold water to it to make the icing reach soft peak consistency. Divide the icing into 2 bowls. Leave one bowl white and divide the remaining icing between 4 small bowls. Colour these blue, yellow, green and red. 9) Add water drop by drop to the coloured icing and mix to a piping consistency. Spoon the coloured icings into 5 piping bags fitted with writing nozzles. 10) Add water drop by drop to the white icing and mix to a piping consistency. Spoon into a piping bag fitted with a writing nozzle. 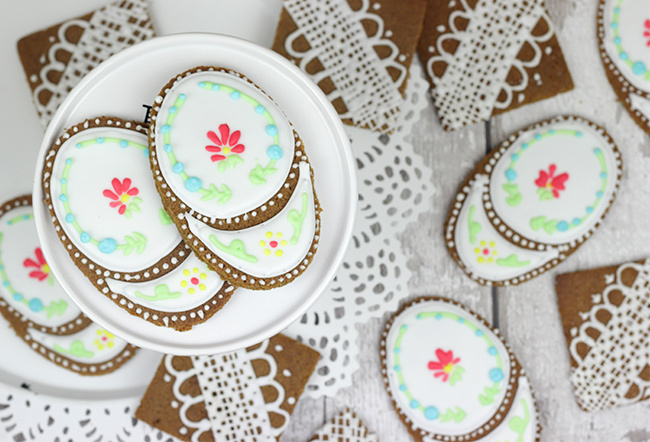 11) Decorate the biscuits with icing designs; I used the templates they used on Bake Off as a guide which you can find on the Bake Off Recipes website. 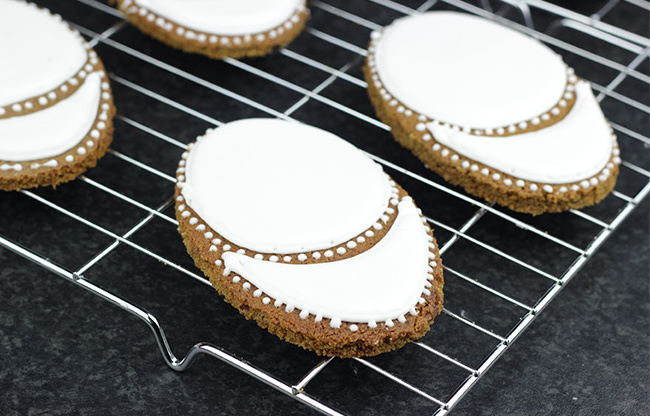 12) First, for the oval biscuits; pipe the outlines of the designs using white icing and leave to harden. 13) Flood the inside of the outlines with the white icing then gently tap and shake the biscuits to level out the icing and leave to harden. 14) Pipe little dots around the edges of the design. Then use the other coloured icings to pipe on the flowers, lines, leaves and dots. 15) For the square biscuits; pipe the longer lines first from corner to corner then pipe the shorter lines the opposite way over the top of the previous lines. Pipe dots in the centres of the square lace design and then pipe the curved designs along the edge to create a lace like effect. My piping needs a bit of work to create neater designs but I’m pretty pleased with how they turned out! 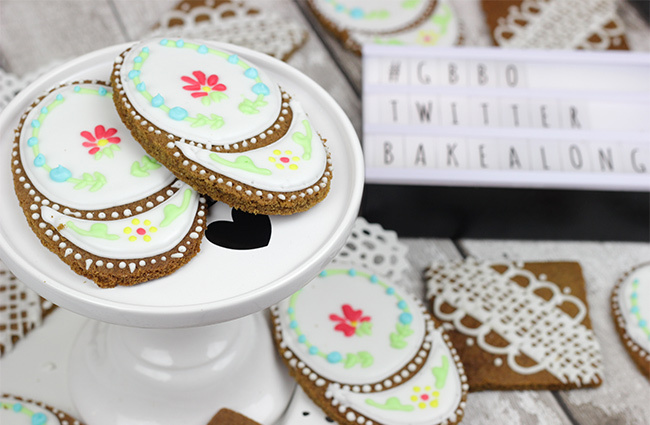 And that’s a wrap for my #GBBOTwitterBakeAlong series for 2017!! 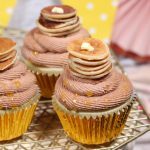 I’ve really enjoyed the series this year as well as creating all the bakes each week and sharing the results and recipes with you here! A massive congratulations to Sophie for winning this year! 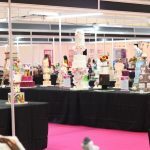 Bring of Great British Bake Off 2018! 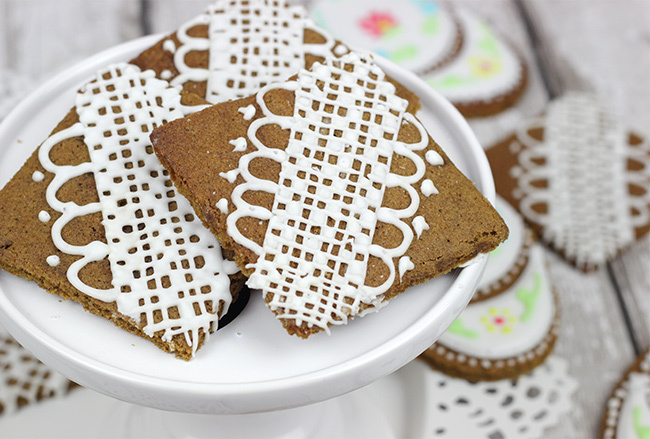 Can these be made with dairy free butter?